Get all the details on the new Transit Connect for commercial use in Dallas with this Ford Transit Connect review. As a premier Dallas-area Ford dealer, Grapevine Ford feels it's our responsibility to offer research materials on all Ford models as a courtesy to our customers. The new 2013 Ford Transit Connect is the consummate service vehicle with its winning combination of design, cargo capacity, power and economy. The stylish Transit Connect makes a good impression on your customers while delivering practicality and fuel efficiency. The Wagon carries five passengers and still has room for 78.4 cubic feet of freight. 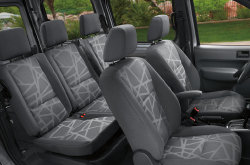 Flip and fold the seats to increase cargo capacity to 118.7 cubic feet (129.6 in the Van). Transit Connect's two-liter engine delivers 128 lb.-ft. of torque, so this tough little van can carry a heavy payload. Add to this a 21/27 MPG rating and you have every reason to read on and consider the 2013 Ford Transit Connect for your Dallas-area business. When comparing the 2013 Ford Transit Connect next to the 2013 Nissan NV, Ford Econoline, RAM Cargo, Mercedes Benz Sprinter and the Chevy Express, and you'll catch that the Transit Connect ranks above those autos in quite a few aspects. See just a few of the reasons below. See inside the 2013 Ford Transit Connect - view video here! Your Ford should be treated right - that means Ford factory- trained Transit Connect technicians, genuine Ford parts, and the peace of mind that comes from a 12-month service dealer warranty. Grapevine Ford service and auto repair in Grapevine is a click away! Fords in Grapevine can take a whipping, so turn to the auto repair wizards in Grapevine - Grapevine Ford. The following is only a tiny percent of what we handle: tire replacement, muffler repairs, serpentine belt replacement and much more. We also manage a large array of specialized services. It's obvious - to get cut-rate prices and wizards Ford repairs, Grapevine Ford should be your first choice when selecting a Grapevine auto center. Click the upcoming link to find the latest service specials now! You've seen a lot of features available with the 2013 Ford Transit Connect in Dallas, so it's time to get down to the nitty-gritty. Fact: Ford Transit Connect is an excellent economic choice. 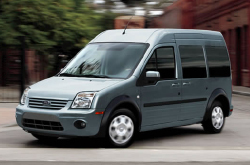 Transit Connect has four base models ranging in MSRP from $22,425 to $24,200, customizable cargo areas, best-in-class fuel efficiency and "built Ford tough" durability. These are all good reasons to come down to Grapevine Ford for a test drive and a discussion about your particular business needs, and we'll help you figure out which option package will best fit your situation. Our staff is ready to help with more details on custom packages, pricing, financing and leasing options.